If you’re still reading fantasy football articles on adds and drops heading into Week 14, odds are that your squad is in the mix for a playoff berth with aspirations of a deep run. At this point of the year, we no longer need cheap bye-week fillers taking up our benches. We want high-upside guys in case of emergency. This week’s edition will focus on dropping players that are most likely just occupying space on your bench and likely won’t ever see your lineup the remainder of the season. Two weeks ago in this segment, I recommended dropping Michael Crabtree, who has since continued to put up lackluster fantasy outings (3-21-1, 3-36-0). After getting a larger sample size of Lamar Jackson, it’s safe to drop all of his receivers. Jackson’s lack of pass attempts per game (21.7) lowers the ceiling for all his receivers, making them volatile fantasy plays. Brown’s targets since Jackson took over (1, 7, 0) are a perfect example of that. 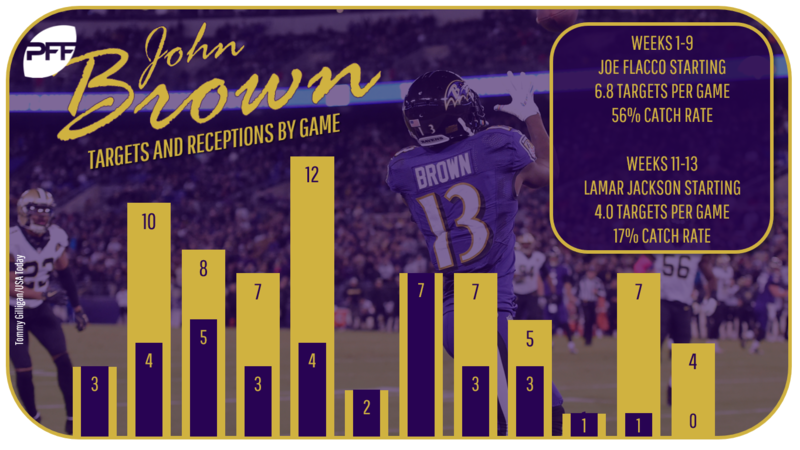 We utilized Brown earlier in the season due to his ability to make big plays downfield. Brown’s role in this offense as the downfield threat has remained the same during this quarterback switch, but his catch rate has fallen from 55.7% in Weeks 1-10 down to an unusable 16.7% over the past three weeks. After being placed on the Commissioner’s Exempt List and released from the Kansas City Chiefs last Friday, Hunt cleared waivers Monday and is officially an unrestricted free agent. If a team were to pick him up, he’d still remain on this Commissioner Exempt List, meaning he cannot practice, play, or attend games until cleared from this list. We’ve seen the NFL take their time during these investigations, often turning them into a lengthy process. Shed Hunt from your roster now and fill his bench space with a player more likely to see the field this year. What went wrong here? The No. 2 receiving option in an Aaron Rodgers-led passing offense should be putting up prolific fantasy stats on a weekly basis, but MVS just isn’t getting it done out there. Despite running nearly route-for-route with Davante Adams since Week 5, MVS has seen his receptions drop precipitously over the past three weeks (1, 1, 2). Letting go of Mike McCarthy certainly helps from a PR perspective, but do the Packers’ coaching replacements have an answer to turning this offense around? I’m not trying to risk finding out that information in the fantasy playoffs. After what looks like another wasted year of Rodgers’ prime, hopefully MVS can be more productive in Year 2. Last week with Leonard Fournette serving a one-game suspension, we had the dream scenario of Hyde having any fantasy relevance for streamers. Despite Jacksonville coming away with the win, it wasn’t due to Hyde’s work. Hyde was held to just 36 yards on 13 carries and caught his lone target for one yard. It was a disappointing fantasy outing and likely the most work Hyde will see in a single game for the remainder of the season. He’s a safe drop in all leagues. Like Brown, Thomas is also playing on a run-first team that makes it difficult to rely on target volume. 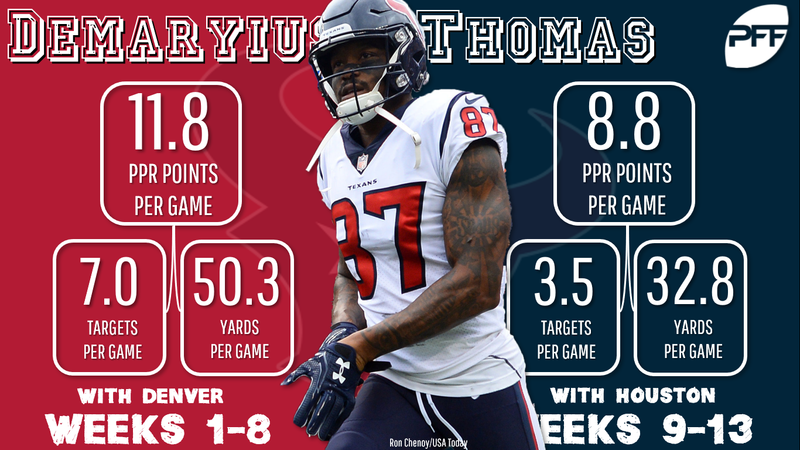 Thomas has yet to surpass four receptions in a game with his new team, as the Texans sport the second-heaviest run-play percentage in the league (48.2%). He moved from the 1A/1B top target in Denver to a receiver clearly playing second-fiddle to DeAndre Hopkins. Since Thomas joined the Texans, he’s seen just a 14% target share compared to Hopkins’ 30%. Even Keke Coutee (23%) is seeing more volume his way when active. Don’t let the two-touchdown outlier fool you. Thomas is a secondary receiver on a run-heavy team that likely won’t see enough volume to warrant starting as a fantasy receiver. Shepard has had his moments this season, but they were highly predictable ones based on soft slot cornerback matchups. Unfortunately for Shepard, he doesn’t run into many of those from Weeks 14 through 16. The Giants face the Redskins (18th in FPs allowed to slot WRs according to our Positional Matchup Chart), Titans (27th), and Colts (25th) during that span. Shepard’s target volume has fluctuated wildly as of late, while his fantasy performances have remained consistently underwhelming. Barring an injury to Odell Beckham Jr., Shepard looks like he could have a quiet fantasy postseason. The return of a healthy Jamison Crowder has relegated Quinn to backup duties. Quinn ran 34 slot routes in Week 12, but an injury and Crowder’s return left him inactive Monday. Crowder took over the slot responsibility and saw three slot targets (team high) while running on 78.9% of the team’s slot routes. Unless Crowder has any kind of setback, it looks like Quinn’s fantasy relevance may be lost for the remainder of the year.